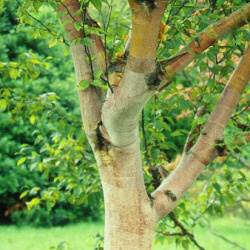 Buy Chinese Red Barked Birchonline from UK tree supplier. 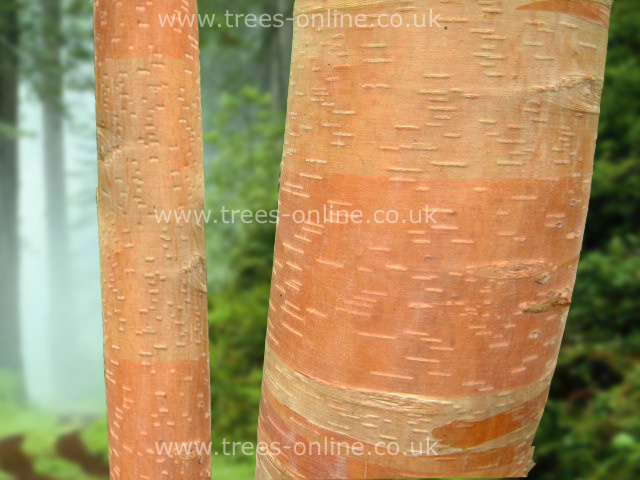 Chinese Red Barked Birch (Betula albosinensis septentrionalis ‘Kansu')(native to Szechuan in Western China) has a strong growing form with multi-coloured bark consisting of copper and pink making it a striking feature in any garden. particularly interesting in Winter when your garden looks like someone has dialed down the colour. It has a twiggy light canopy which allows some light through allowing you to plant shade tolerant plants close by and you can expect the leaves to turn a pale yellow in Autumn and a sea green in Summer. Mature tree heights are completely dependant upon weather, soil conditions and many other factors and examples of this species have been found at 40 years old being 15m-21m (50-70ft) high with around a 15m (50 ft) spread. The word septentrionalis was given to this tree by "Ernest 'Chinese' Wilson" in 1908 whilst on an arboretum trip. It describes the seven stars of the Plough and for some reason the bark reminded him of this (don't see it myself). It might have something to do with the tree growing in Northern China but who knows! You can cheat if you are looking for a multi-stem version (popular but difficult to grow) by planting three trees in the same hole.